Okaaaay, it’s officially that time of year. Christmas Cookie mayhem…. And I am so excited to share with you a whole new variety that I have never made up until this past weekend when I created them and then promptly ate 6. Eek. 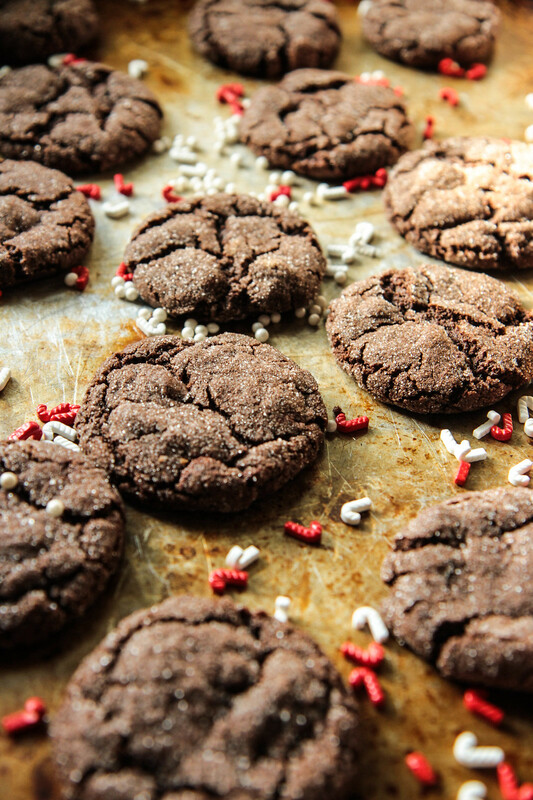 Peppermint Mocha Crinkle Cookies, my current favorite. And by the way, that is really saying something because I am not even a chocolate addict by a long stretch. So to say that I was obsessed with these is a testament to how awesome they are. Slightly crisp on the outside due to their sugary coating, and soft and chewy on the inside- these are also incredibly easy and is basically a foolproof dough. I also have to call out that I liked this play on a traditional powdered sugar Crinkle since it is a less in your face sweet cookie and again, back to that crispiness you get from the granulated sugar. Ok- then there is the coffee and mint flavors which are absolutely amazing with the chocolate. I think that these will be huge winners with your friends and family this season! Measure and pour the chocolate chips into a small bowl & microwave 75 seconds and then stir until melted. Set them aside to cool. In a medium bowl, combine the flour, cocoa powder, baking powder and sea salt. Set aside. In the bowl of a standing mixer fitted with a paddle attachment, cream the vegan butter and sugar. Add the pumpkin puree, espresso and peppermint extract then slowly add the cooled chocolate. All the ingredients have to be at room temperature or the chocolate will seize up and get hard. If that happens, just gently heat over a pan of simmering water until the chocolate loosens back up. Add the dry ingredients to the batter and beat until everything is well combined and you have a stiff sticky dough. Using a 1 ½” ice cream scoop, scoop the dough and then use your hands to roll the dough into little balls. Dredge the dough balls in the sugar and roll around until thoroughly coated. Place the cookie dough balls on the sheet pans and bake at 350 degrees for 10-12 minutes. 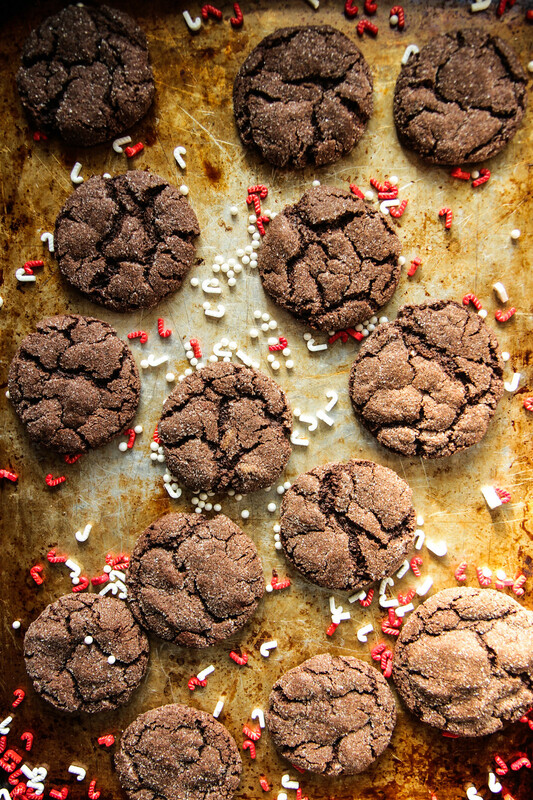 Remove the cookies and set aside to cool slightly before removing from the sheet pan. These cookies are amazing. Thank you Heather for sharing this recipe and making our holidays a little more delicious. Ps Had to sub sweet potato purée for pumpkin but it worked great. 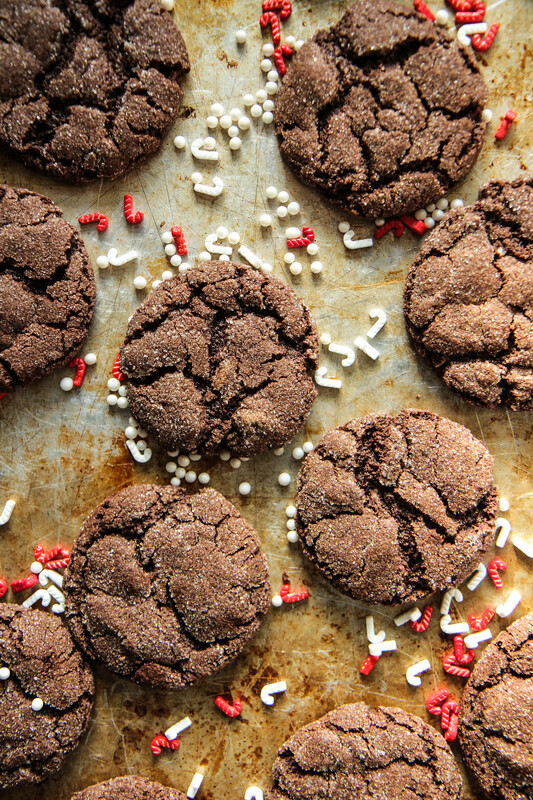 Peppermint Mocha Crinkles – Kosher salt listed in ingredients but sea salt listed in directions. oops! meant to be kosher salt! Sorry, this was the WORST. I am only commenting to save others their time, effort and ingredients. Uck what a gross disaster.